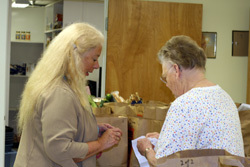 Marionette Changes and Andy Powell pack bags full of produce for distribution to elderly and handicapped people. ALEXANDRIA, Va. (UMNS) — Andy Powell, David Miller and Frank Baker take brown paper bags full of fresh produce and canned goods out to waiting vans. Marionette Changes keeps a careful eye on the men to make sure the right bags get in the right vans. Changes and the others are members or regular attendees of Rising Hope United Methodist Mission Church, a church whose membership consists mostly of the poor and homeless along Washington’s Route One Corridor. 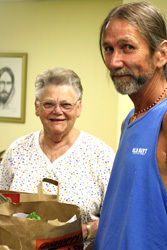 On this day, the church is delivering food to the elderly and handicapped in the community. The Rev. Keary Kincannon says some of the hidden victims of Sept. 11 live in the Route One Corridor just south of Washington. Rising Hope was one of the recipients of United Methodist Committee on Relief’s “Love in the Midst of Tragedy” grants given after the Sept. 11, 2001, attacks on the Pentagon and the World Trade Centers. Powell, Miller and Baker are some of the “secondary victims” of Sept. 11 helped by the grant money. The Rev. Keary Kincannon, pastor of Rising Hope, explains that some of the hidden victims of the tragedy live in the corridor just south of Washington. They are minimum-wage earners who cleaned motel rooms, served food in the restaurants, worked in shops catering to tourists at Mount Vernon and other attractions, or drove taxis to nearby Reagan National Airport. After the attacks, the tourist trade dropped dramatically, taking jobs with it. Rising Hope Church was established in 1996 to bring “spiritual and material relief” to people who live in the area. 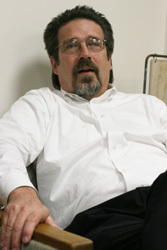 About 60 percent of its members are homeless or have been homeless at some point. “Many of our members live in the woods, their cars or in shelters,” says Laura Derby, church administrator and grant writer. Rising Hope has many members who suffer from mental health problems or addiction. Derby says they were thrown into an emotional tailspin by the terrorist attacks. Laura Derby (left) and Marionette Changes prepare bags for loading onto vans. One example is “Evelyn,” a single mother with one child who has suffered from mental health issues much of her life. In 2001, she was struggling to hold a job. She went into a depression after the attacks and was hospitalized for severe clinical depression and suicidal tendencies. She was hospitalized three times during the 18 months after Sept. 11 and was diagnosed with bipolar disorder. Rising Hope was able to give her support and find employment again. The church provided clothes for her and her child and assisted with bills for prescriptions, utilities and food, Derby says. According to Kincannon, the UMCOR grant “helped us rise to another level” of serving the community. The first years after Sept. 11 were especially tough for the immigrant population, says the Rev. Herb Brynildson, pastor of St. Matthew’s United Methodist Church, Annandale, Va.
“People were weary of immigrants regardless of who they were,” he recalls. State and local governments cracked down on the services they would provide to people without proper identification. That action affected immigrants, the poor and the homeless. Brynildson helped write the proposal from the United Methodist Virginia Annual (regional) Conference to receive “Love in the Midst of Tragedy” monies. Virginia United Methodists then disbursed nearly $1 million to six organizations, including Rising Hope. The largest amount went to Grace Ministries, a community outreach program to the Hispanic community. The ministries provide food and clothing, rent assistance, job training and retraining, worship in Spanish and pastoral counseling. Brynildson says Grace Ministries was able to expand its outreach into two new locations and now serves four areas with ministry, worship opportunities and legal services. “Legal status is not important to who we serve and how we serve,” he notes.